As I mentioned in my previous post, once autumn hits I am always on the hunt for winter squash recipes. I found this recipe in the February 2011 Bon Appetit magazine (yes I hold on to cooking magazines for a really long time ha!). I changed a few things from the original recipe to make it more kid friendly, and a little healthier. This recipe is for little ones 10+ months who are ready for finger food and Mommies and Daddies of all ages. You can also puree this for little ones 8+ months. Heat 2 tsp olive oil in a large nonstick skillet over medium high heat. Add the squash and season with a little salt and saute until it begins to brown, stirring often (approx 5 minutes). Reduce heat to medium, and add the chopped sage, cook until squash is tender, about 8 minutes. Remove to plate and wipe skillet clean. While squash is cooking put quinoa in pot with 1 cup water and 1 1/2 cups chicken broth. Bring to a boil, then cover and reduce heat to low or simmer. Cook for 12 to 15 minutes or until all liquid is absorbed and quinoa is tender. Heat 2 tsp olive oil, in same large skillet that was used for squash, over medium high heat. Add chopped onions and a pinch or 2 of salt and saute until onions are tender and beginning to brown (approx 5 or 6 minutes). 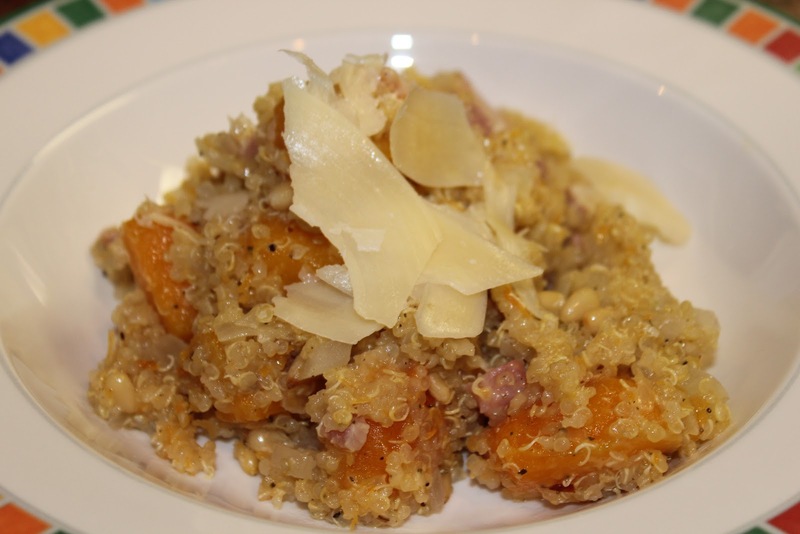 Add cooked quinoa, grated parmesan, pine nuts and pancetta to onions in skillet and toss. Cook for 2 minutes, add squash and season with a little salt and pepper. Toss to coat. Cook for a few more minutes and then transfer quinoa to a large serving bowl. Top with shaved parmesan, serve and enjoy! If you are pureeing, place your little one's portion (4 to 5 oz) into a food processor and add water until you get the desired texture. Just made this for the second time yesterday. Just want to thank you again for doing this blog - I really love it!! Aww thank you! So happy you love my blog and are enjoying the recipes! !